Silverstone has revised the RV05 enclosure to reduce size and cost using the space more efficiently. They've added some new features and cut down on others to make space for liquid cooling systems. In fact, it's footprint does more to focus on presentation while trimming off the internal fat. Silverstone was the first manufacturer to implement a 90 degree mounted system in their Raven series enclosures. In other words, the IO or back of the motherboard actually faces the top. Since hot air rises, it made thermal sense to help video cards as well as CPU coolers push hot air out the top while bottom fans pull cool air into the chassis from the bottom. While the design works, previous enclosures were quite large sporting extra cost in plastic body molds and metals. Things that the new Silverstone RV05 seem to bear in mind. 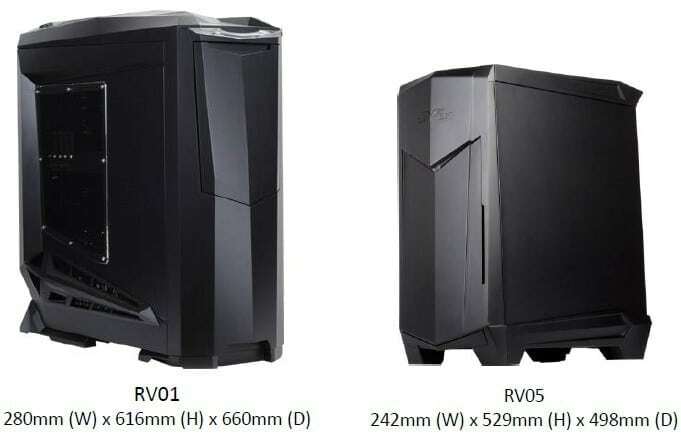 Keeping time with DIY trends, Silverstone has revised their "Raven Series" enclosures to reduce size and cost using the space more efficiently. They've added some new features and cut down on others to make space for liquid cooling systems. 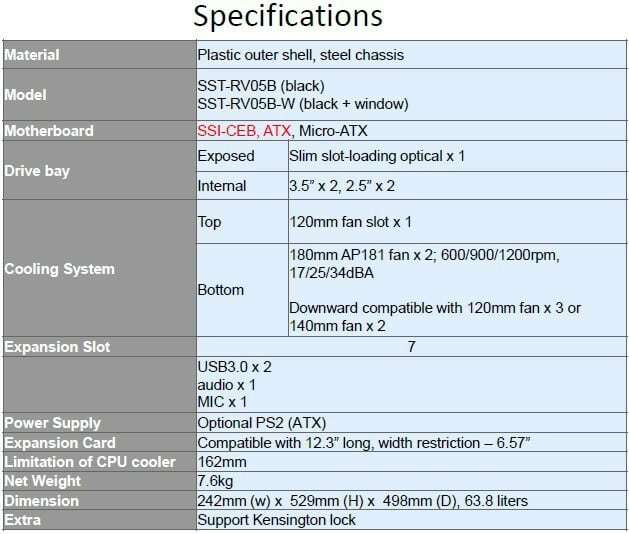 So what features are key to the Silverstone RV05? Remember, some of these are carried over from the previous version but here is the break down list. The Stealth-lever locks are kind of cool since it negates the need for thumb screws. Pull the lock and the panels slide up and off. One thing we would have liked to see on such a creative enclosure is a fan hub, or splitter. It's not a deal breaker. Just something nice to have since not all motherboards offer fan control. As you can see from the dimensions, the Silverstone RV05 is much lighter (16.75 lbs) and smaller than previous models which reached 27.5 pounds. Previous full tower enclosures have their place and purpose but if you're looking for something easier to carry for your next LAN party, this would be a much easier chassis to haul. If you're hunting the RV05 down, many retailers are offering the enclosure for as little as $110-$115 USD. That's quite a bit cheaper than some of the previous generation. Silverstone includes the usual items to ensure a solid installation. They've even included something highly reusable for us OCD wire management nuts. Finally, someone is finally paying attention to our jabs about single use zip ties. Velcro straps make it so easy to change the system up and can be used in future builds. Now, if we can just get a little fan splitter to manage fans. Next, let's have a look inside and outside of the Silverstone RV05.